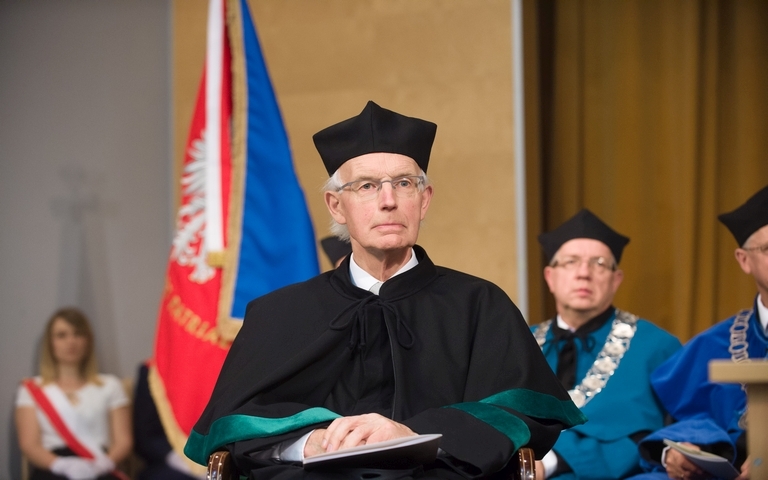 The Senate of the University of Warmia and Mazury conferred upon Professor Aart de Kruif the title of honorary doctorate. This most important award was presented for outstanding scientific and organizational achievements in the field of clinical veterinary science. In particular, the Senate appreciated the professor’s research on the reproduction of livestock animals and the health of the herd; his active and efficient implementation of new educational ideas in the European education of veterinary doctors; his support for the development of the Faculty of Veterinary Studies at the UWM in the adoption of European programmes and standards of clinical education. 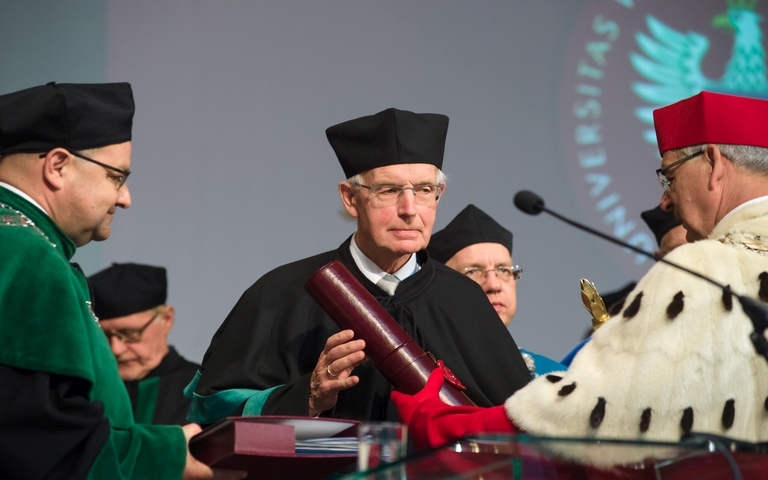 The ceremony was held on July 4, when the university celebrated its anniversary. Prof. Aart de Kruif was born in 1947 in Woudenberg, Holland. In 1971, he completed veterinary studies at Utrecht University in Holland. At first, prof. de Kruif worked as a veterinary doctor in Someren, Holland. In 1987, he found employment with the Faculty of Veterinary Medicine at Ghent University, Belgium. At the same time he was appointed the head of the Reproduction, Obstetrics and Herd Health Department, which he managed for 25 years. In the years 1997-2006 Prof. de Kruif was the Dean of the FVM in Ghent. Under his management, the faculty underwent a deep transformation of the didactic process and a dramatic improvement in teaching quality. It became one of the leading European faculties of veterinary medicine. Prof. de Kruif has made a great contribution to international scientific cooperation. He was a co-founder of European science associations and institutions which organize the international system of scientific and vocational retraining, e.g. EAEVE – an association which evaluates the level of education provided by veterinary medicine faculties in Europe. Prof. de Kruif has a remarkable body of scientific works: 294 positions in the Web of Science database, 59 of which published in renowned scientific journals. He has been cited 5,890 times (H41 index). Such interest in the professor’s works follows from the fact that the issues he deals with are current problems in practice and economics. He uses modern research procedures and has published his works in widely read international magazines. The professor is also active outside the realm of veterinary science; he is a member of the Belgian Royal Academy of Medicine and was a member of the Medical Committee for the Belgian government. Prof. de Kruif has promoted 14 PhD holders, some of whom are renowned professors. He is a founder of the Ghent science school, which is highly respected in Europe and worldwide. The Faculty of Veterinary Medicine at the UWM has been in contact with its counterpart in Ghent for 20 years. It was part of two didactic projects concerning the harmonization of curriculums for veterinary studies as well as the creation of a system of health care and productivity of dairy cow herds. Prof. de Kruif also enabled the UWM staff to take part in numerous clinical internships and training sessions, and supported their activities in European organizations. It was thanks to Prof. de Kruif’s support that the UWM Faculty of Veterinary Medicine achieved European accreditation.